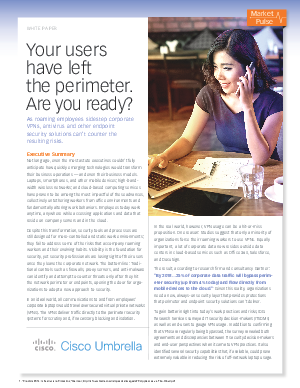 Resource Centre > Research Gateway > Cisco Umbrella EMEA > Whitepaper: Your users have left the perimeter. Are you ready? Not long ago, even the most astute executives couldn’t fully anticipate how quickly emerging technologies would transform their business operations — and even their business models. Laptops, smartphones, and other mobile devices; high-bandwidth wireless networks; and cloud-based computing services have proven to be among the most impactful of these advances, collectively untethering workers from office environments and fundamentally altering work behaviors. employees today work anytime, anywhere while accessing applications and data that reside on company servers and in the cloud. Cisco Umbrella can help your business overcome these problems, download this whitepaper today to find out more.